Written by Nicole Kohler on July 13, 2015 Blog, Content & copywriting. Content marketing has become a crucial marketing method for hundreds, if not thousands, of brands across the world. Now that the attention of consumers is tougher than ever to capture, content is a fantastic way to cut through the clutter, solve problems, and provide necessary education. Not every company has found success with content, however. Some have given it a shot, but haven’t seen any results. Then there are the businesses that haven’t even tried it, mostly because they aren’t at all certain what kinds of content they should produce, or what their customers want. To succeed with content marketing, your business needs to take a unique approach that suits your industry and your audience. This might sound easier said than done, but if you ask the right questions — and take a look at a few helpful examples — you can easily identify what kinds of content your customers are craving, what needs you can meet, and how you can play a bigger role in their lives. Today, we’re going to look at some examples of content marketing in a few popular industries, and show you how they can guide you down the path of creating your own laser-focused approach to content creation. Ready to go? Keep reading to first learn why a unique approach is necessary for this form of marketing. The questions you asked in these situations — and the answers you inevitably sought out — were very different. And the same applies to other industries and types of products. The needs of your customers vary by situation and industry. This is why your approach to content marketing can’t be “one size fits all” — why you can’t simply take broad advice or mimic the actions of another brand. What your potential customers need help with, want information on, or would like to know more about is unique. It’s up to you to learn what will answer their questions, educate them, and eventually motivate them to buy. Now that you have a better idea of why your content marketing program should be unique, let’s start looking at how some popular industries are handling their own content needs, and what you can learn from each one. Clothing, fashion accessories, and personal style brands lend themselves exceptionally well to content marketing. It’s easy to create how-to content around these types of products — how to wear X, why to try Y — but that means more competition, and less of an opportunity for your own brand to stand out. To truly find success with content marketing in this industry, a brand needs to go above and beyond. They need to find ways to meet the expressed and unexpressed needs of their customers… even if those needs have nothing to do with the products they sell. Let’s look at some obvious needs first. Makeup manufacturer Maybelline has an entire “Makeup Trends” content section on their website. 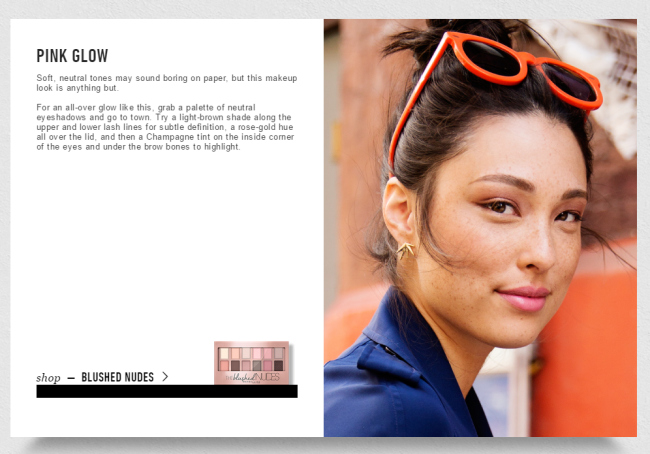 Each highlighted trend offers multiple suggestions on achieving the look, including close-up photos. Maybelline educates customers on achieving this particular look with makeup. 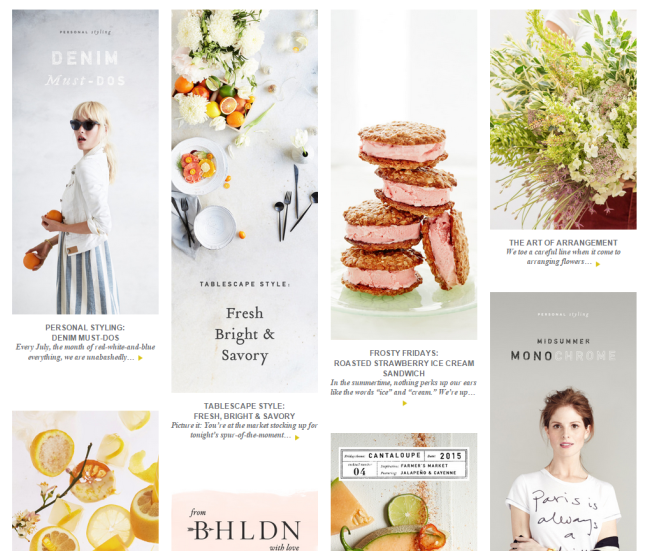 These tutorials don’t just make tricky “looks” seem simple and attainable — they ensure customers are kept up to date on trends, helping them stay current and stylish. Birchbox, a monthly style and beauty delivery program, also tackles trends and how-tos in a section of their site called The Guide. 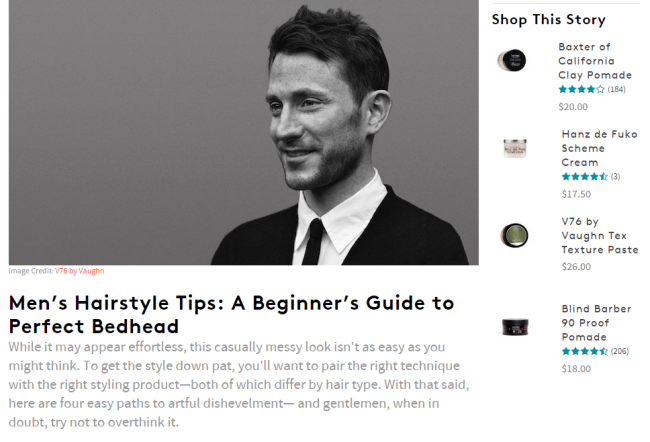 Tailored for men, The Guide has how-tos explaining how to choose the right cleanser or best swim trunks for your body type, as well as blog posts highlighting topics fashionable men might find interesting — for example, man buns, BBQ tips, and the best rum available for under $30. A Birchbox article detailing how to accomplish the bedhead hairstyle, along with links to products that can help you get there. Much like Maybelline, this keeps Birchbox customers up to date on fashion trends — an expressed need. But it also plays a bigger part, offering men content that is useful in other parts of their life. This happens even in areas that Birchbox doesn’t serve, like cooking or clothing. Anthropologie’s blog has many relevant — though not product-related — articles. These types content pieces may not directly sell a product, but they do fit into the lives of the brand’s target customers, which helps increase the value that Birchbox or Anthropologie has to buyers. As an added bonus, this unique, well-designed content is also likely to rank in Google searches, which can potentially lead even more customers to the store — even if they start out by searching for a cocktail recipe. The takeaway: Fashion and beauty brands think about what their audiences crave, whether it’s tips on how to wear their makeup or concrete suggestions for hostess gifts. Meet the needs of your own customers head-on — even if you’re not promoting yourself within your content — and you’ll create long-lasting, highly valuable loyalty. It’s one thing to sell pillows or drywall, but it’s another to tell customers what you can create with them. Home improvement and decor companies have a unique opportunity to stand out by inspiring customers to create incredible things with their products, and there are already plenty of businesses doing it well. Home improvement chain Lowe’s, for example, could simply advertise their sales on tools or wide selection of paint and hardware. But instead, they have an entire section of their website devoted to content marketing, called “Ideas & How-Tos.” This section is filled with projects that can be accomplished using items found at Lowe’s, ranging in difficulty from simple to complex. 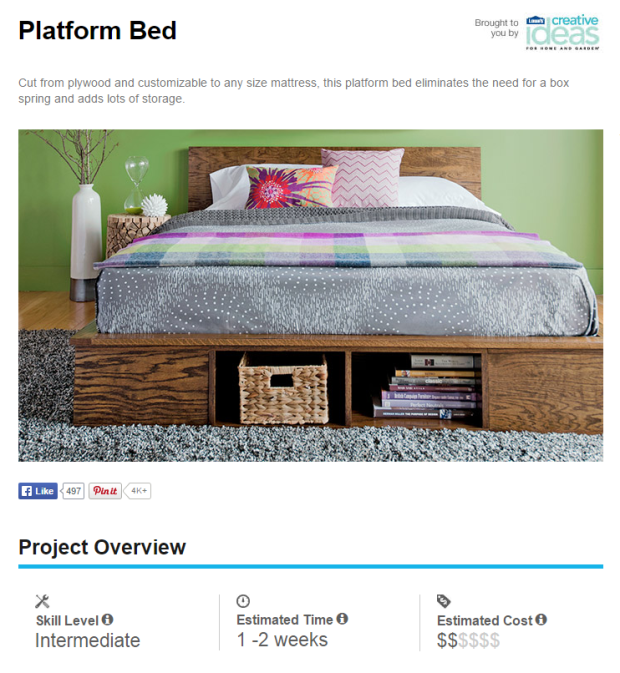 Lowe’s explains how to create this platform bed. There’s also a quick video overview showing how the platform is assembled, which can help interested crafters decide whether or not it’s achievable before they buy any supplies. Lowe’s has hundreds of projects in this same vein, and they all accomplish the very same thing: they empower customers to accomplish great things with their products. Home decor supplier Wayfair does much of the same. Decorating a house can be a challenge, so they created an “Ideas & Advice” section that’s filled with tips, trending styles, and large photos of completed rooms with links to look at similar products. Wayfair offers some tips for achieving this particular look. Where Wayfair’s content really shines, however, is its “Room Inspiration” section. Here, hundreds of real rooms created by professional designers and design agencies are sorted into categories like modern, contemporary, coastal, and so on. 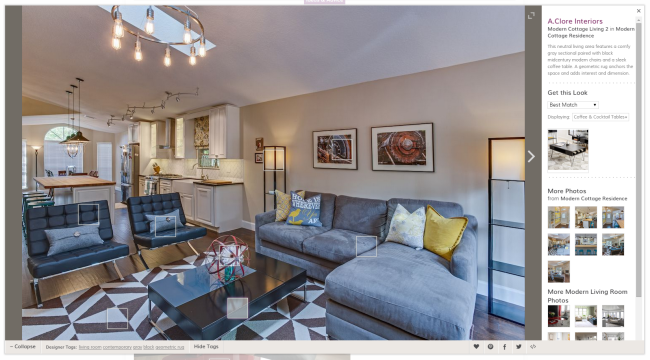 Visitors can click on any room to see a large photo, and then click on select items to view comparable or identical products in the store. 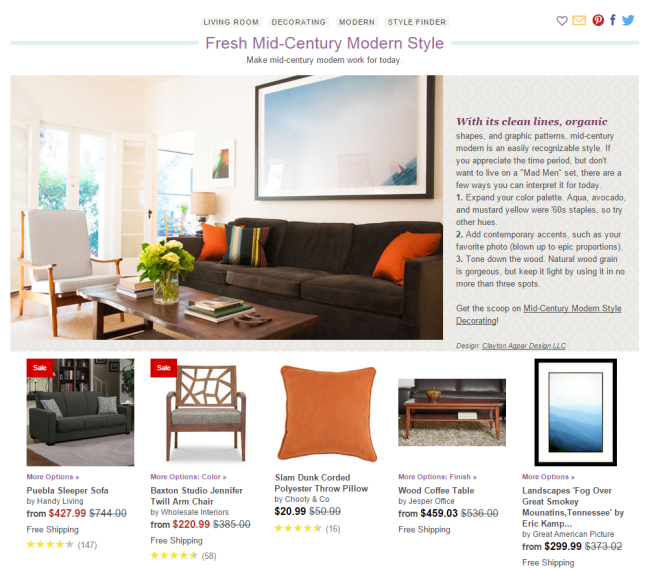 A designer room, complete with links to similar products. With these resources, Wayfair is bringing something complex within reach. They’re enabling anyone to design a better home, even if they don’t buy the products from their store. The takeaway: Content marketing for home improvement and decor focuses on making something complex or confusing attainable. How can you make an otherwise complex task involving your products seem less challenging? What projects can be accomplished with the items you sell, and how can you convey those in your store? If you’re in the technology industry, you know that customers are only as loyal as their experiences. If they have a good experience with your product, they’ll stay with you. If they have a bad one, they’ll be long gone to your competitors before you even have a chance to help. Because of this fickleness, it’s difficult to find many technology brands making a long-term investment in their customers. “Why bother?” you might think. But a few brands have decided to use content marketing to increase their value and grow their relationship with their customers, helping them succeed either personally or professionally. Credit card processor Square chose to take this approach with their Town Square blog, opting to create and distribute posts made purely for assisting with small business success instead of those focused on Square. Resources are made available that explain basic business items — like payments, payroll, and bookkeeping — as well as interviews with other store owners and timely articles about changes in the industry or how to manage a growing company. A selection of articles from the Square blog. Square realizes that the part it plays in a business is a very small one, and that they can be replaced at any time. So they choose to increase their value by helping businesses grow and succeed with incredibly useful content. This grows their role exponentially, taking them from a mere payment processor to a trusted source of advice, ideas, and inspiration. This kind of approach might seem like a lot of work. But creating this kind of long-term value can translate into your business being utilized long-term. You can be replaced at any time with another supplier, but a customer might be reluctant to switch if your content has been useful to them. And if they’re having a problem, they might contact you about it instead of simply switching, knowing from your content efforts that you care about your customers. The takeaway: Think about how your products or services fit into the big picture. How can you arm customers with the tools they need to succeed? Find ways to add real, long-term value that go above and beyond your singular piece of the puzzle. One of the most well-known stories in content marketing actually involves a “boring” industry: fiberglass swimming pools. River Pools and Spas was once a small, local business with slumping sales. Their owner, Marcus Sheridan, found that customers were searching online for answers to questions about fiberglass pools and weren’t getting answers. So he started writing blog posts that answered their questions directly. A post from the River Pools and Spas blog. Several years later, River Pools and Spas is thriving, and has now grown into a national business. This is all because Marcus decided to create content that directly answered the questions of potential customers, no matter what they were. 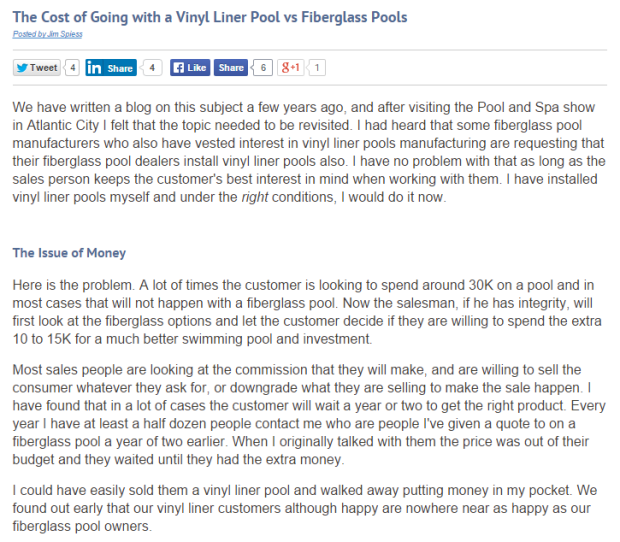 He even addressed pricing and compared fiberglass pools to competing models — two topics businesses generally avoid. This model is a great one for any industry, but especially those you might think of as boring. By answering questions — especially the ones that no one else wants to address online — you can establish your brand as one that is willing to educate its customers so they can make the best choice possible. Educational content is also more likely to be evergreen than some of the other content shown above, so it might rank higher and longer on search engines. The takeaway: Even “boring” industries have interested followers seeking out further education. Look for questions that no one is answering, or seek out ways that you can make your customers better at their jobs. Education is one of the best ways to create customer loyalty! Whether your business belongs in one of these industries or operates in another sphere entirely — or perhaps doesn’t even exist yet! — we again reiterate that you should create your own unique approach to content marketing. Though it’s true that most fashion brands operate in the same way, your fashion brand’s audience is different, so you should just use the tips and ideas in this post as a starting point for your own experiments. Go looking for questions that haven’t been answered well. You can use a keyword research tool like KeywordTool.io, or even Google’s autocomplete feature, to find queries related to your industry. If you can’t find content that properly answers a question, that’s an opportunity for you to create it. Listen to — and write down — feedback. Sometimes customers will say “I wish you would explain how to…” or ask “could you tell me why…?” Take note of these special requests and consider how to transform them into content. If one person’s asking, chances are good that several others want the same thing. Look at what your competitors are (or aren’t) doing. A little healthy competition never hurt anyone. Spy on your competitors and see if they’re serving up any successful content, or if they’re leaving a gap in the market for you. Tap into user generated content. If you’re lucky, your customers will be creating content about you already, whether it’s simple quotes or full-blown projects. Show off this content — with their permission, of course — to get a head start on your marketing program. Content marketing can sound daunting to new businesses, but its incredible potential makes it worth a try for nearly every industry. Whether you sell clothing or manufacture hardware, with a little research and exploration, you can find an approach that allows you to connect with customers and grow your online presence exponentially. We hope all the examples, ideas, and suggestions in this post have given you plenty of inspiration from which to draw from. Now get out there and give content marketing a try for yourself! Or, if you’ve got a few questions or suggestions for us first, feel free to leave them in the comments — we’ll be more than happy to help you out. Unique content along with branding, be it fashion, music, home improv, or in any business is necessary.